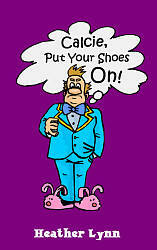 Calcie, Put Your Shoes On! Performance Time: Approximately 20-25 minutes, 17 pgs. CHILDREN’S COMEDY. In the town of Loaferville, people really like to wear loafers. This is a big problem for Calcie, since she hates wearing shoes (especially loafers) but loves wearing pink furry slippers. One day, Calcie hides her pink furry slippers in her backpack and takes them to school. At school, she secretly slips off her shoes and puts her slippers on. Calcie’s teacher discovers Calcie’s slippers and reports the incident to the principal. The principal informs the police chief, who then calls the mayor. When the residents of Loaferville hear of Calcie’s preference for wearing slippers instead of shoes, the town erupts into chaos until some shocking secrets are revealed at a town council meeting! With a flexible cast, there’s a part for everyone in the class. The set is simple and can be composed with classroom furniture including desks, chairs, and small tables.